Even though many of us at AAA-1 Masonry & Tuckpointing have been restoring masonry structures well before the turn of the century (and certainly before organizations like Angie’s List even existed), it still feels good to be formally recognized for exceptional workmanship and service from such a well-recognized organization. 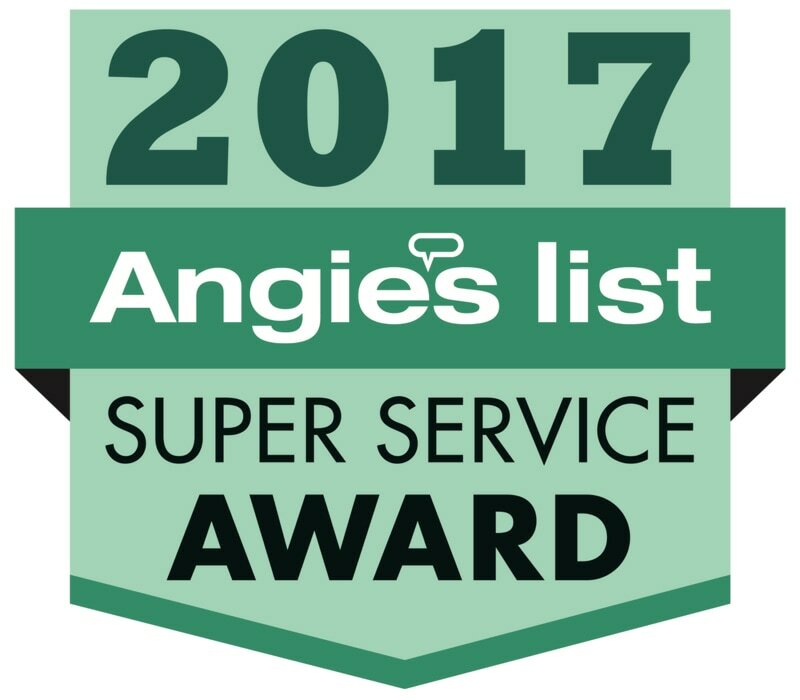 The Angie’s List Super Service Award is given to fewer than 5% of all contractors found on Angie’s List, and requires exceptional service ratings over the course of the year. Sincere thanks to all of you for your kind praise and recognition of our commitment to the highest standards in the masonry arts. Now in our 65th year of family ownership, AAA-1 Masonry & Tuckpointing specializes in mortar restoration (including historical mortar matching), brick replacement, chimney and parapet wall rebuilding, lintel repair, caulking, cleaning and sealing. Call us for a free and informative consultation or request a proposal by clicking on the red button in the upper right corner of the screen. Post: What's That Haze On My Bricks? 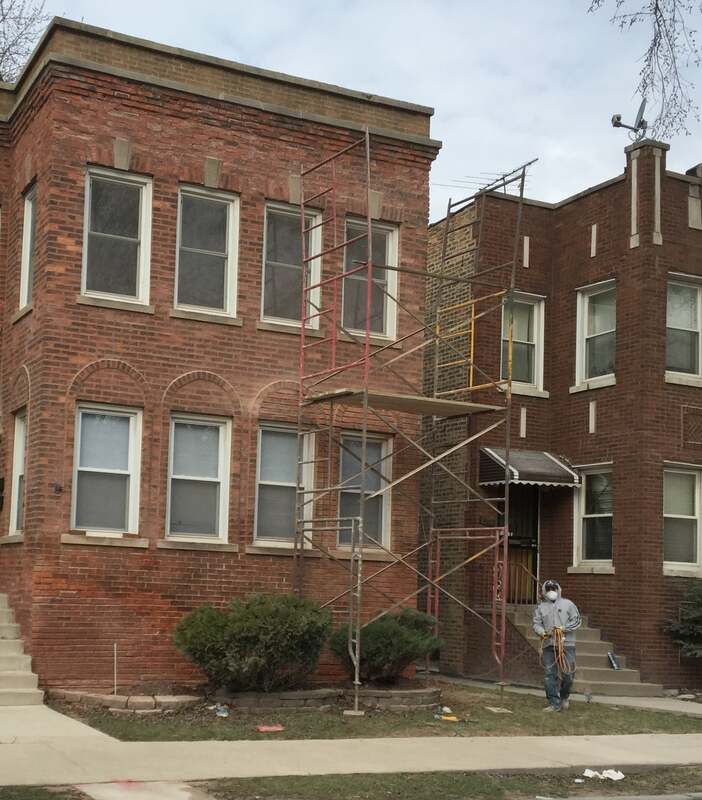 Because of our commitment to quality restoration work, we get called out to address masonry issues on many very nice homes and buildings in Chicago, the North Shore and the Near West suburbs. It's a real compliment and not one that we take lightly. So when we start to notice a whitish haze appearing more and more frequently on newer luxury homes and buildings we start to get concerned (and curious). 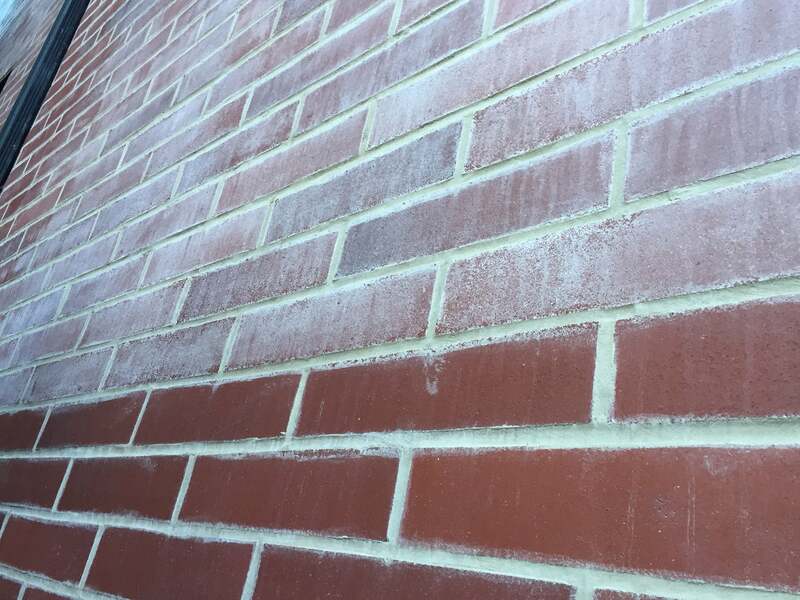 For those of you who know a thing or two about newer masonry structures, you might look at this photo and conclude this wall is suffering from efflorescence, the condition whereby salts and other minerals leach out of porous masonry walls as they dry out. Brick efflorescence certainly would be a good guess. But look at the lower several courses of the wall. These bricks have considerably less haze on them. (Actually the little bit of haze on the lower section of the wall looks like mortar sloppily brushed onto the face of the bricks by a previous contractor.) Typically, efflorescence does not stop so abruptly with such nicely demarcated boundaries as seen in this photo. When I rubbed my fingers over the wall, it imparted a greasy film. When I sprayed water on the wall, the haze disappeared and the bricks returned to their bright red color...until the moisture evaporated and the bricks again appeared hazy. As I later learned, the hazy section of the wall was sealed by another masonry company using an inexpensive water-based product that left the milky haze. Because the previous company did not seal the lower 6 feet of the wall, this was the only section that did not turn hazy. This water-based product appears to have been rolled on to the wall, which helps to explain the stark demarcation between treated and untreated wall. AAA-1 Masonry & Tuckpointing does not use water-based sealants because they do not penetrate as deeply into masonry substrates as our 100% silane solution. Fortunately, we were able to use a masonry detergent and a hot-water power washer to remove about 75% of the hazy film from the wall. Some very fancy-sounding masonry sealants do a poor job at repelling wind-driven rain and seem to leave a haze behind (e.g., Master Protect H177 Clear Sealer; and Enviro Double-Seven are two that come to mind). Before you or your contractor brush, paint or spray any product on your masonry walls, test a small area of your wall with the product and make sure you like what you see. An ounce of prevention might save you a lot of disappointment and cost. Tuckpointing is a very general term to describe the application of new mortar over old mortar in the spaces between your bricks, stones, terra cotta or cinder blocks. Tuckpointing aids in keeping your masonry building in good shape because new mortar, if applied correctly, works like glue to keep your building materials bonded together and prevents wet weather events like rain and snow from infiltrating the masonry walls and damaging the integrity of your building. Typically grinding work is performed using hand-held machine grinders and vacuum attachments (used to mitigate the release of dust). In the photo, Andrew is grinding out multiple layers of defective mortar on a 100-year-old garage. As you can see, previous owners repeatedly applied new mortar right over defective old mortar to the point that the mortar overflows the space between the bricks. Not a nice look and definitely not the way to preserve the integrity of the brick structure. Sometimes the integrity of a masonry structure is so compromised that grinding and tuckpointing won't do the trick. (This may be the case, for example, if cracks in the mortar joints run the full depth of the wall or the masonry is loose to the touch.) If your masonry walls are too deteriorated for grinding and tuckpointing, then they may need to be dismantled and rebuilt altogether. Our licensed estimators can recognize and explain the appropriate repair methods needed for your building. I passed by this job site in the Avondale neighborhood of Chicago just as the mason had completed his spot grinding work and stepped off the scaffolding. I was relieved to see the mason wearing the required eye protection. 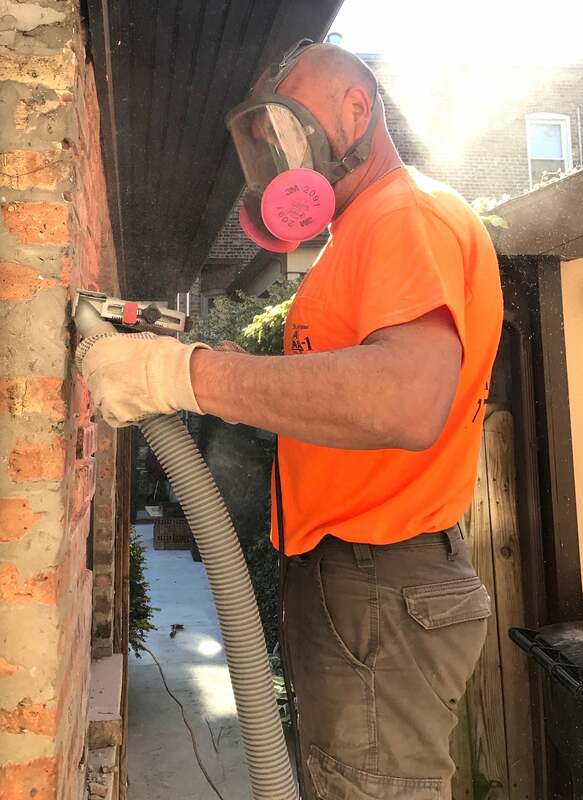 But his paper mask is not OSHA approved for this type of work and does not adequately protect against the inhalation of silica dust generated when grinding mortar. I was also really concerned about the scaffolding set-up. The wood planks installed about 10 feet above the ground and intended to serve as a work platform were not secured to the scaffolding with wire or by other means, the job site was not wrapped in any dust-suppressing mesh to reduce the public’s exposure to silica generated when grinding mortar, the scaffolding tower itself was not secured to the building anywhere (an OSHA requirement to prevent the scaffolding from tipping), and the top of the scaffolding tower lacked cross braces (and looked like it could tip at any moment). This is an unsafe work environment and puts the mason (and the passing public) at risk of injury and silica inhalation. Make sure that your masons have the right equipment and know-how to create a safe work environment for themselves and for you. 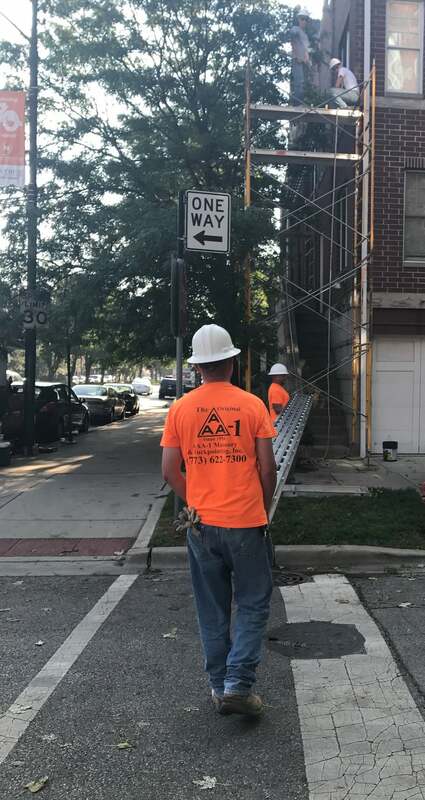 All masons at AAA-1 Masonry have their OSHA-10 safety cards and are ceritified in the safe set up and use of tubular pipe scaffolding and swingstage scaffolding.